Master of Cruelties can only attack alone. Whenever Master of Cruelties attacks a player and isn't blocked, that player's life total becomes 1. 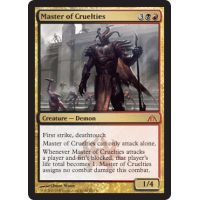 Master of Cruelties assigns no combat damage this combat.